BMW has announced a major recall of 1.3 million of its previous generation 5 and 6 series models for what is potentially a serious problem: an incorrectly mounted battery cable. Recalls because of potential fires has become a major problem for BMW in the last six months. BMW is claiming "in some remote cases" that the battery cable cover in the trunk may not be mounted properly in this most recent fire related problem. That could result in the electrical system malfunctioning, the vehicle failing to start, and, even worse, starting a fire. The affected vehicles are BMW 5 and 6 series built between 2003 and 2010. This is being called a "quality measure" by BMW and it probably technically is because it is not a government-mandated recall. That could have been disastrous for BMW because it would have involved a recall notice from the National Highway Transportation Safety Administration and the European New Car Assessment Program (NCAP) as well as safety agencies across the globe. According to published reports, 367,000 of the vehicles are in the U.S., while 109,000 are reported to be in Britain. (See below for a link to one Londoner who has the right job for a BMW 5 series that might catch on fire.) The breakdown for the remainder of the recalls by country was not readily available. The 5 series is an important vehicle to BMW across the globe. In 2011, it sold 310,050 models, which represents 22 percent of BMW's overall 1.38 million vehicles sold. The news of the recall is not yet posted on BMW's US media website. The information was announced on BMW's global media website. The good news is it seems to be a relatively simple fix. It should only take 30 minutes at a BMW dealership. Owners will be notified in writing about the recall. This is not the first fire related recall of BMW vehicles in 2012. Reuters reported that in January BMW had a global recall of 235,500 Mini vehicles, a step taken by the German automaker because electronic circuit boards could overheat and cause a vehicle fire. As with the fire concerns in the BMW 5 and 6 series, "BMW was unaware of accidents and injuries caused by the possible defect." It is in a manufacturer's best interest to make that statement because it implies no prior knowledge of a problem. In instances where it does know of accidents and injuries, it would be required to report them. A quick Google search did not show any instances of BMWs that caught fire in their trunks. But one owner might be happy that his employer is the London Fire Brigade. A YouTube video shows him driving his personal BMW 5 series to respond to a call. In October 2011, the National Highway Transportation Safety Administration also ordered the recall of 32,000 BMWs in the U.S. because of a fire hazard in an electronic circuit board. 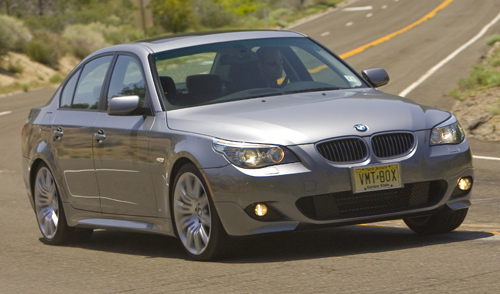 The affected models, all from the 2008-11 model years, were the 5 Series, 5 Series Gran Turismo, 7 Series, X5 and X6 equipped with turbocharged 8- or 12-cylinder engines.